Back with another post this week and another tag! I covered my tag with Peacock Feathers Distress Ink (I think this is my new favourite) then embossed my tag with Craft Concepts cottage floral folder and went over it with Black Soot Distress Ink to pick out the embossing better. I used the dress & button die cut again inked in Peacock Feathers and over stamped with black with Kaiser Craft Magic Happens stamps. to finish off I added ribbon, gems, lace and flowers from my stash. This fortnight's challenge over at Crafty Boots has been chosen by Helen and is New, this could be new crafty stash (which is what I have used) a new technique, new home, new baby, etc. So on to my piece for this I decided to make a tag and use some new die cuts I got of eBay and a relative new technique which I learnt at one of the lovely Gabrielle's classes last year. I took a size 8 tag and covered it in metal tape that you can get form the hardware stores and cut it in to little pieces and stuck them to the tag (This is a technique I learnt at Gabrielle's class where we made a block which I really must upload onto here) I the applied alcohol (pool, mountain rose & hazelnut) inks to it and ran through an embossing folder. I inked my die cuts in peacock feathers distress ink then popped a mask over it to add the flowers and stamped the word dream on to the cotton reel. I added ribbon, lace and gems from my stash. Hope you can join us over at the Crafty Boots challenge. Sorry I have been away from blog land for so long we have had terrible internet problems. After many arguments with AOL we have now switched to BT which fingers crossed has been working fine so far. Hope you all have a lovely bank holiday weekend and enjoyed all the Jubilee celebrations. I watched quite a bit of it on the TV and loved every minute of it. I thought the Queen looked lovely in all her outfits as did the rest of The Royal Family. I've had the papers for a while now and can't remember where they are from the pre colored image and stamped sentiments are from Lili of the Valley. Buttons are out of my stash. Hope you all had a lovely crafty weekend! I have used Dylan in the Daisies Digi stamp only available form Crafty Boots, I have used Promarkers to colour him in. I made my own back ground using masks and Spun Sugar Distress Ink. The ribbon started of as white but I coloured it using Spun Sugar Distress Stain. The pins and pearls are from my stash and the flowers are from Wild Orchid Crafts. The sentiment stamp is from Lili of the Valley. Please pop over to the Crafty Boots Challenge Blog and check out the fabby work from the rest of the team and hope you can also join us. Hope you all have a fab week. I used Kaisercraft Magic Happens clear stamp set, Dusty Concord Distress inks, Tim Holtz script stamp, white Picket Fence Distress Stain and of course flowers, ribbon and pearls. Please pop across and check out the fab work by the rest of the team and why not join in too! I used red and cream card from my stash the ribbon and lace is also from my stash. 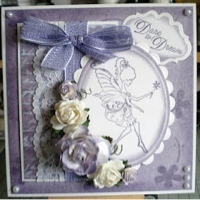 The stamp was embossed in silver embossing power and the flowers are from Wild Orchid Crafts. I live in a small village in Leicestershire with my husband and border collie dog. I love card making in my spare time but I also enjoy reading and going out with my friends and family. I like to garden as well and find it very relaxing.